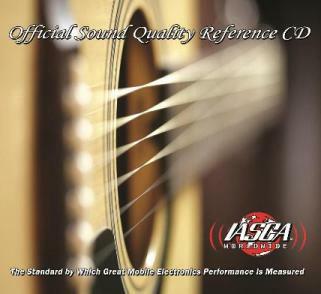 IASCA Worldwide is pleased to announce the release of an all new Sound Quality Reference CD on August 1, 2016. Unlike its predecessors, the new release is a two-disc set. Disc One is the evaluation CD and contains 32 new technical tracks and snippets of musical tracks for judging car audio systems. Disc Two is the entertainment CD; it contains the full length version of the musical tracks used on the evaluation CD for the listener’s enjoyment. The choice of musical tracks was carefully chosen for their ability to clearly define the sound quality of the system it plays on. For more information on the new SQ CD, click the arrow in the top left corner of the image! 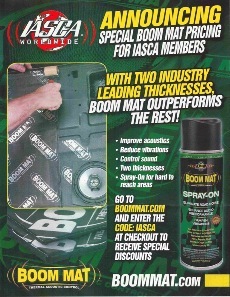 Boom Mat announces special discount pricing for current IASCA members! Welcome to IASCA Worldwide! IASCA (an acronym for the International Auto Sound Challenge Association) is a car audio competition organization dedicated to the growth of the mobile electronics industry. Car audio competitions called "Soundoffs" are held in 34 countries around the world, setting the standard for great sound, quality installations and sound pressure levels (SPL) through our rules for competition. Welcome to our community; please browse our website and visit our Facebook page to learn what quality mobile electronics and products are all about! IASCA competition ranges from the best sounding to the loudest car audio system, as well as car show judging and lighting contests. Come join us today and show off your ride and system! IASCA Worldwide works closely with partners around the globe to help build the mobile electronics industry, including the Consumer Electronics Show (CES) in Las Vegas each year. Whether you drive a compact car or a transport truck, if it has a stereo, IASCA has a competition format for you! Our goal is to help our industry grow and get you excited about great sound in your ride!